Energy efficiency and water efficiency are powerful strategies for sustainable business success. The PREMA® training programme provides concepts and tools towards implementing resource efficiency in a sustainable way. It is creative, interactive and supports required change processes. 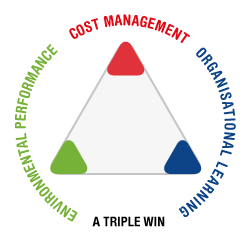 Reduce costs of production and improve resource efficiency. Enhance organisational capabilities of employees.